I love keyboard shortcuts. I find using a mouse, menus and clicking to be an incredibly inefficient way of doing things. I spent a lot of time in college working with Adobe programs and using three and four character keyboard shortcuts to get things done faster. So when I found gleeBox and the amount of time-saving shorthand it had to offer. I was pretty excited. 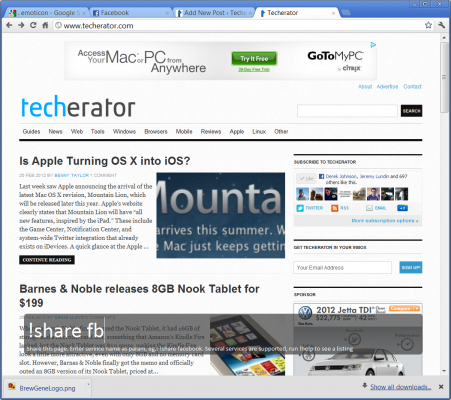 GleeBox is a browser add-on available for Chrome, Safari, and Firefox. Once installed, pushing the G key will bring up the dialogue box. From here you can input a variety of commands as simple as opening a search page in a new window, to sharing whatever page you happen to be viewing with your friends via Facebook, Twitter, or Gmail with the input of a simple command. Pushing the period key will show a list of open tabs. Pushing the Period (.) key will bring up a list of the current tabs you have open in your browsers. From there you can use your arrow keys to select the tab you want. There are also functions such as :wp and :tube that will allow you to search for a term on Wikipedia and YouTube respectively. The amount of options available are endless due the ability to customize actions. This allows you to tailor gleeBox to do things that you typically do while browsing. I like to share websites with my friends on Facebook and the ability to share a link without having open up a different page and copy and paste the URL is really pretty cool for me. I am not much of a Twitter person, but the command that will automatically share whatever page you are on with a shortened URL would also seem to be pretty handy. All in all gleeBox is a pretty cool and useful app. The amount of default commands available, and the ability to customize, means the sky is the limit. How do you find out about things? I’m talking about things like interesting places to visit while on vacation, a good place to eat, whether or not a particular bicycle seat is worth buying. Well, that and more. Chances are you take one of two routes. One, you turn to your favorite search engine. Or two, you ask a friend or someone in your social network a question or three. 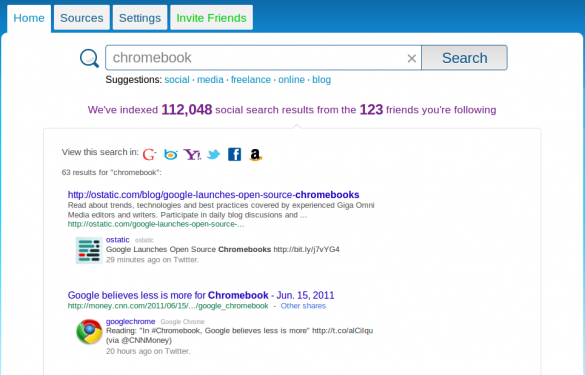 What if you were able to combine those two approaches and make your searches a bit more social? Well, Wajam tries to do just that. And, for the most part, it succeeds. Let’s look at the concept and the technology. The idea behind Wajam is to improve the results that a search engine returns by combining those results with mentions of, say, that product or place from your online social network. More on how to combine the two in a few paragraphs. Wajam itself is a browser extension for Firefox, Chrome, Safari, and Internet Explorer. Once installed, it works in the background and adds results derived from your social network to the results from Google, Bing, Yahoo, Amazon, Facebook, Twitter, and Blekko. Head over to the Wajam and log in using either your Twitter or Facebook login information. Wajam links to your account. When you start searching (more on this in a moment), will add hits from your network. And once you’ve logged in, you can download and install the extension for your browser. But what happens if, say, you logged in using your Facebook account but want to add your Twitter account to Wajam? On the Wajam Web site, click the Sources tab. Then, click the icon for Twitter. But it’s not just your Twitter and Facebook friends. If you have an account with the bookmarking service Delicious, you can link that account to Wajam. You can also upload a bookmark file from your computer to the Wajam dashboard. That’s a potentially great feature: using your past choices to help enhance your searches. There are two ways you can do that. The first way is to head over to your favorite search engine and plug in a search. The search engine will do its thing, but at the top of the results Wajam adds mentions from your social networks about what you’re searching for. If one of the results from Wajam fits you bill, then just click a link to jump to that page. You’ll notice the Wajam toolbar at the top of the page. You can use the toolbar to share what you’ve found on Facebook or Twitter. The second way to search is within Wajam itself. When logged in, click the Home tab. You’re taken to a search engine that actually combs your social networks and uploaded bookmarks (if any) for matches. Click a link to open it. Again, you reach the page you get the Wajam toolbar that lets you share that page on Facebook or Twitter. The results themselves can vary. For example, I wanted to find some places to do indoor bouldering in Toronto (where I live) — I searched for bouldering Toronto using Google. The results that came back from Wajam were … well, interesting. I got a tweet from a musician who did a show in Toronto, and a pointer to a blog mentioning a company with an office in Boulder, Colorado. The results from Google, in this case, were more focused. Also, the freshness of the information can be a bit of a problem. The two results I mentioned in the last paragraph were two months and two years old, respectively. You can sort the results by relevance, newest mentions, and older mentions. But a useful addition to Wajam would be a way to set a range of dates over which to perform a search. While Wajam has an extension for Google Chrome, I wasn’t able to download and install it in Chromium (the Open Source version of Chrome). That’s strange, because every other Chrome extension I’ve tried with Chromium has installed and has worked. Wajam takes search to an interesting new place. By adding a social element, your search results are potentially better targeted and focused to your needs. And, you’d hope, with that social element you’re also getting an element of trust in your results — opinions or just links from people whose opinions matter to you. I’m not sure that Wajam fully achieves those goals. At least, not yet. But it’s definitely worth taking a closer look at Wajam. Note: In this guide, I’ll be using Firefox version 3.6.8. Details in this procedure may vary according to your version. 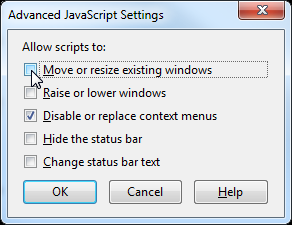 Step 1: In Firefox, click Tools then select Options. Step 3: Uncheck the box that says “Move or resize existing windows“. That’s it! Those pesky websites won’t be able to resize your browser window anymore. 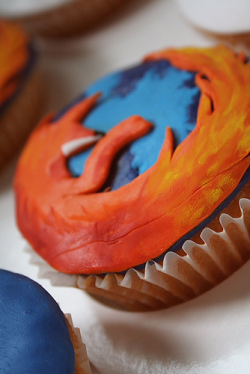 Make sure to check out the rest of our articles about Firefox! Building websites that function properly across multiple browsers can be a time consuming process. Most of that time is put into backwards compatibility to support outdated web browsers – I’m looking at you, IE6. If a client or end-user of your website is experiencing a problem, it can be a difficult task to ask all of the questions necessary to pinpoint the cause of the problem. Support Details is a simple and easy-to-use web application that will gather all of the necessary information about your client’s personal computer. To use Support Details, you can simply send your client to http://www.supportdetails.com. Your client will be presented with information about their PC as shown below. Have the user fill-out the information bar at the top of the page with their name, email address, and your email address and click Send Details. 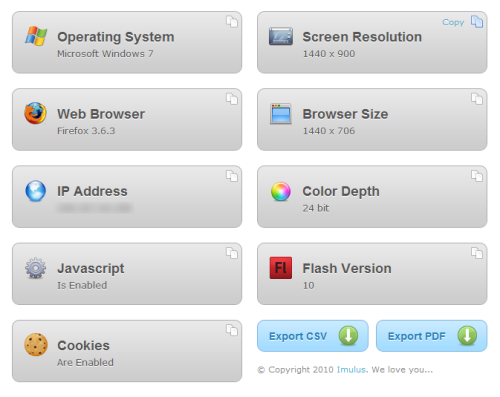 They also have the option to export their PC’s information as a CSV or PDF file. Support Details lets you create custom URLs to send to your clients with the correct contact information already entered, so all they have to do is click Send Details. Let us know what you think about Support Details by commenting below! Many people are aware of the instant popularity of the Google Chrome web browser, taking just over 3% of the browser market share upon its release. Opera, a competitor in the web browser market since 1996, has only achieved a 2% market share in the past 14 years. The Opera developers aim to get back into the web browser market with the 10.50 release of the Opera web browser. 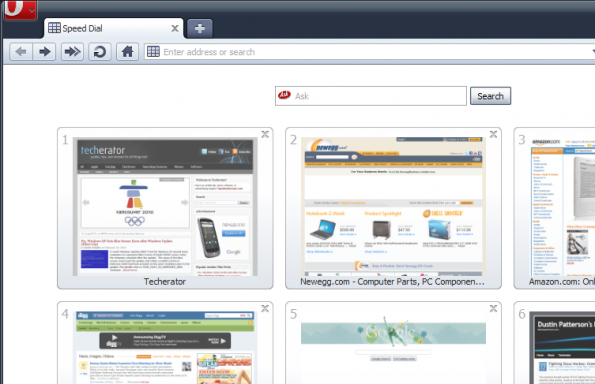 The Opera 10.50 web browser boasts some features that all internet users will enjoy. I’ll go over some of the major features of Opera 10.50 in this article. Opera Turbo is a feature that can help decrease page load times if you happen to be on a slow connection. Using Opera’s compression servers, web pages are compressed up to 80%, allowing your pages to load faster. Opera Turbo also helps to decrease page load times by preventing Flash content such as YouTube videos from loading until you click on them. Image sizes are also reduced to decrease page load times. Opera Turbo features an automatic mode, which will sense if you network connection has become slow, and enable Opera Turbo. Opera already supported tabbed browsing, but a new feature in version 10.50 are Visual Tabs. Visual Tabs allow you to see a preview of the open tab, along with the page title. Visually recognizing the tab can sometimes be easier than referring to the page title. Opera 10.50 also offers tab previews. Hovering the mouse over a tab will show a quick thumbnail of that tab. Speed Dial allows you to quickly access your favorite sites whenever you open a new tab. When opening a new tab, the Speed Dial page is shown with your 9 favorite sites. Speed Dial pages can easily be changed or removed from the Speed Dial page. Mouse Gestures are a way to quickly perform common web browser actions with a right-click and movement of the mouse. Some common browser actions you can perform with Mouse Gestures include opening new tabs, closing tabs, previous page, next page, reload, home, and many more. Opera Link is a feature included in Opera 10.50 that allows you to sync your Opera browser information between multiple computers. Opera Link allows you to sync bookmarks, Speed Dial, notes, history, and searches, allowing you to have them available wherever you are. If you use Opera at home and at work, Opera Link is a great way to keep the same browsing information synced between the two computers. Opera Link is also a great way to backup your browser information automatically. One of my favorite features of Opera 10.50 is the integrated email support. Opera integrated email supports both POP and IMAP email and is easily configured. Once your account has been added, your email is automatically fetched and displayed. 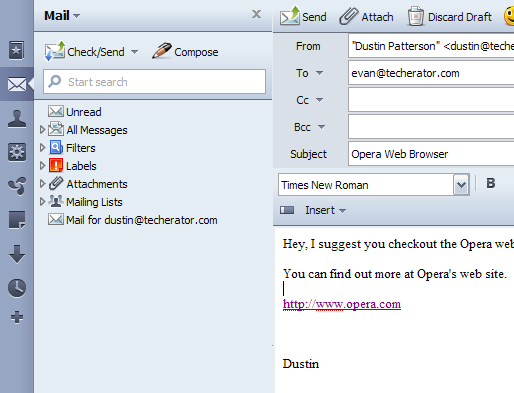 Opera’s integrated email also allows composing and sending of emails with the feature rich editor. Another promising features of Opera 10.50 is Opera Unite. Opera Unite is a set of extension applications that add functionality such as photo sharing, music streaming, and file sharing, all from your browser. Opera Unite already features a wide list of community developed applications with more constantly being developed. New to Opera 10.50, Opera Widgets allow you to run your favorite internet service outside of your browser. Acting like desktop applications, Opera Widgets allow you to access services like Twitter and Facebook even when your web browser is closed. Opera features many community developed widgets, with more being actively developed. If you’re looking for a fast, full-featured web browser and want to try something other than Firefox and Chrome, then I suggest you give the Opera 10.50 a try. I’m sure everyone will find something they like about the Opera web browser. 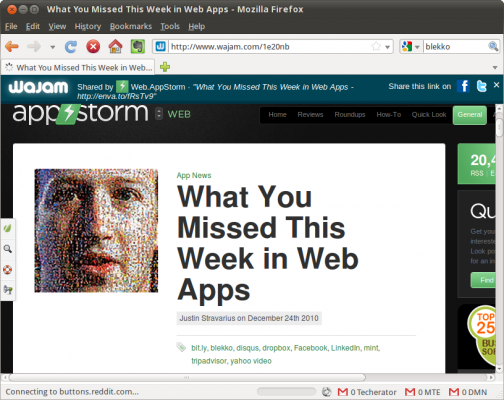 Have you used Opera as your web browser? What is your favorite upcoming feature of Opera? Let us know your thoughts about Opera by commenting below! One of the most useful features of Firefox are add-ons, small applications that can add new functionality to the browser or change its appearance. Unfortunately, there are literally thousands of add-ons available, meaning that many of the good ones get lost in the noise. In part one of our featured Essential Add-ons for Firefox series, I’ll be covering add-ons that I feel are vital to getting the most from your browsing experience. This add-on quickly skyrocketed on my of “Things I must have in Firefox” list. Tree Style Tab changes your horizontal tab bar into a vertical bar with a tree hierarchy, which can give you more vertical space on a widescreen monitor. Although it takes a little getting used to (I still instinctively look to the top of my screen), you will be able to manage many more tabs at a once. Tree Style Tab is very customizable and works well with other tab modification add-ons. Check out our full guide to Tree Style Tab. Windows only: Let’s be honest – there will always be a few websites that only render properly in Internet Explorer. We can hope that web developers follow best practices when creating websites, but in the mean time IE Tab allows you to render any website in Internet Explorer from within Firefox. You can even set it to automatically render certain websites, which works great for *.microsoft.com domains. Occasionally, I’ll encounter an unclickable link. Normally, a person would copy and paste (or type) the address in the URL bar, but Right-Click-Link allows you to right click the dead link and open it without the extra work. This is a great example of the “little things” that can be improved with add-ons. Highlighting URL roots was popularized in Google Chrome, and now Firefox users can add this feature with the Locationbar² add-on. This add-on highlights the root domain of the website you are browsing to help identify phishing or spoofing in URLs. Even better, it makes subsections of the URL clickable when you hold the CTRL or ALT keys, so you can click directly to the root of a website. Multiple Tab Handler adds one of my single favorite features: Close Other Tabs. This allows you to right click a tab (or tabs) you want to keep open and close all other quickly. It also adds features to close, reload, and duplicated selected (or all) tabs. This add-on doesn’t work perfectly with Tree Style Tab yet, but the developers appear to be working together to improve this. Greasemonkey allows you to install small scripts which can dramatically change the way a website looks or functions. This add-on is one of the single most useful on this list, and many Greasemonkey scripts eventually work their way into independent add-ons. Greasemonkey can help you manage multiple gmail accounts, turn you into a Facebook power user, and let you automatically watch YouTube videos in high definition. Check out our full guide to Greasemonkey. Personal Menu can save you some serious space in your browser (which is great for netbooks). This add-on lets you remove Firefox’s standard menu toolbar and replace it with highly customizable buttons. You’ll have an independent button for history and favorites, as well as the Personal Menu button which can contain any of the menus present in the standard toolbar. Xmarks (formerly Foxmarks) is a great way to keep all your bookmarks synchronized across multiple computers. This add-on provides seamless synchronization between your browser and the Xmarks servers, allowing you to access your bookmarks anywhere. Xmarks has the unique ability to sync bookmarks from Firefox, Internet Explorer, and Safari, and also provides a secure password sync (but I recommend sticking with LastPass). Check out our guide to making the most of your bookmarks. The default download manager window in Firefox is clunky and can get in the way. Download Statusbar replaces the standard download window with a small, sleek toolbar that exists at the bottom of your browser. This add-on is incredibly customizable (with more features than the standard window) and can be set to auto-hide to save space. This great little add-on will automatically correct typos in your URL bar. 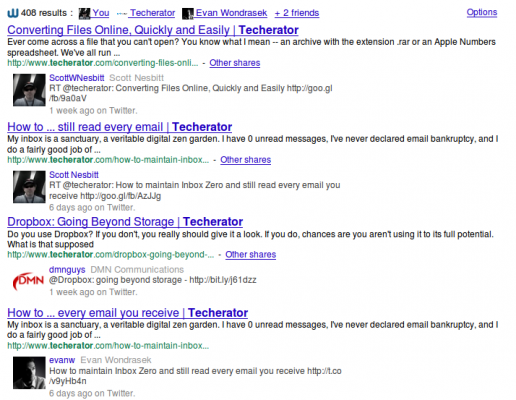 If you accidentally type techerator.con it will automatically suggest techerator.com (and the notification can be disabled for seamless correction). URL Fixer works for common misspellings of .com, .net, .org, .edu, .gov, .mil, and many other URLs. AutoPager will make it so you never have to click ‘Next Page’ on a website ever again. When you reach the bottom of a page (such as Google search results), the next page will automatically be loaded seamlessly with the current page you are viewing. AutoPager supports hundreds of popular websites and will dramatically improve your browsing experience. Note: AutoPager includes advertisements by default, but they can be easily disabled by following this guide. If you’d like to install all of the add-ons in the Techerator Essential Add-ons for Firefox #1: Power User Edition pack, check out our Firefox Collections site. For more great Firefox Add-ons, check out Essential Add-ons for Firefox #2: Socialite Edition. URL shorteners are everywhere, and have exploded in popularity with sites like Twitter that have a character limit per message. While URL shortening services provide a great way to share links quickly with friends – there is also a significant security risk of being sent to a malicious website. For example, check out this great link: http://is.gd/2dPpA. This risk can be mitigated by using a URL expanding service called LongURL, which can help you avoid viruses, phishing, and malware by expanding a shortened URL before you click it. LongURL supports nearly every popular URL shortener, such as tinyurl.com, is.gd, ping.fm, ur1.ca, bit.ly, snipurl.com, tweetburner.com, metamark.net, url.ie, x.se, 6url.com, yep.it, piurl.com, and more. LongURL can be used in any browser through LongURL.org. Simply copy and paste (or type) your shortened URL into the box and click expand to be presented with a screenshot of the website, its title, and any details that can be discovered. LongURL provides a useful add-on for Firefox that seamlessly integrates the service with your browser. Simply install the LongURL Mobile Expander add-on and you can expand any shortened URL by hovering your mouse over it. To view additional information about the link, click the ‘More’ button and you will be taken to the LongURL website. If you prefer to use Greasemonkey (a Firefox add-on that allows you to run user-created scripts to modify websites), check out the LongURL Mobile Expander Greasemonkey script. After installing the script, any shortened URLs will automatically be expanded when you hover your mouse over them. To view additional information about the link, click the ‘More’ button and you will be taken to the LongURL website. Have any tips for safer browsing? Share them with us in the comments! Update 06-16-09: Mozilla has announced in Firefox 3.0.11 that “Several issues were reported with the internal database, SQLite, which have now been fixed by upgrading to a newer version.” So if this guide works for you, be sure to upgrade to the newest version of Firefox. 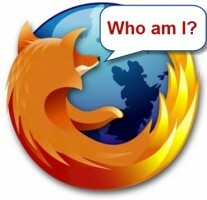 It can strike when you least expect it – Firefox amnesia. The symptom: Firefox no longer keeps you automatically logged in to sites where you have selected the “remember me” option. I recently had this problem, and although Firefox would maintain my logins during my current session, they would immediately be forgotten when I closed the browser. Typically, this problem is related to browser cookies, which are small data files stored on your computer by websites to help identify you and store information. Before you start, it is important that you verify that Firefox’s forgetfulness is not caused by a simpler problem. First, you should clear your current cookies, which can be done by going to Tools –> Clear Private Data and checking the Cookies box. While you’re in there, you could clear your browser’s cache and authenticated sessions as well (just in to be safe). Next, you should temporarily disable any add-ons you are currently using to ensure they are not causing conflicts with your browser’s operation. 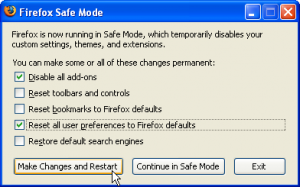 You can systematically disable them one at a time via Tools –> Add-ons, or you can disable them all at once by running Firefox in Safe Mode and choosing to disable all add-ons. To disable all add-ons at once, go to Start –> Mozilla Firefox –> Mozilla Firefox (Safe Mode) and check the “Disable all add-ons” box. You could also check the “Reset all user preferences to Firefox defaults” to make sure it isn’t a problem with your browser settings, but be warned: this will remove any custom settings you have made (such as your browser’s start page). If the methods above did not resolve Firefox’s forgetfulness, then the source of this problem is likely caused by a file called cookies.sqlite becoming corrupt. This file manages Firefox’s cookies, and if it becomes corrupt it can stop Firefox from storing cookies altogether. In this folder, locate the file named cookies.sqlite. Copy this file to a safe location as a backup (or you can rename the file to something like cookies.BAK) and then delete the original. When you reopen Firefox, it will create a new cookies.sqlite file and it should now store cookies properly. Note: If you are still having problems after following this guide, check your virus scanner to make sure it is not modifying or quarantining your cookie files.